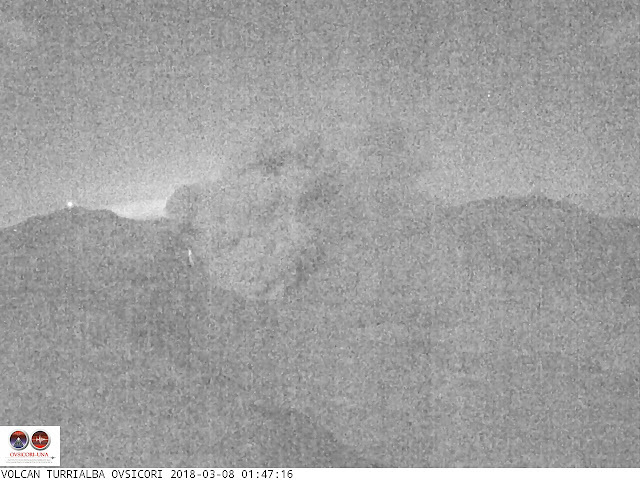 The Turrialba Volcano in Cartago, Costa Rica had for the past weeks presented a diminished seismic activity and also a decreased degassification; however, the volcano raised its voice again this March 7th when it entered a strombolian eruption phase (relatively mild blasts). The phase which began at 00:00 hours included the emission of gases, ashes and incandescent fragments of fresh lava which lasted through the first hours of the morning of this Wednesday. According to Dr Mauricio Mora from the National Seismology Network, a volcanic tremor (signal generated by the flow of fluids, water, gas of magma through the interior conducts of the volcano) was registered along with the activity. This activity is perfectly normal and presents no danger to the population.